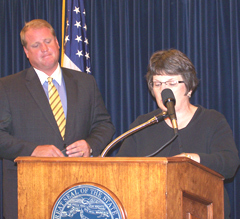 State officials, including Governor Culver, announced a new program today that encourages Iowans ages 45 to 65 to plan for their long-term care. 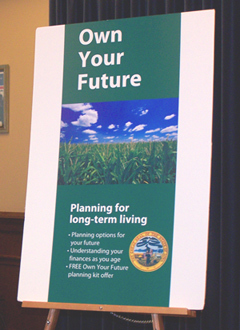 The director of the Iowa Department on Aging, John McCalley, says the program "Own Your Future" is funded by federal dollars. McCalley says AARP research shows not many people think about long-term care, and says the complex decisions for long-term care are often made in a crisis mode without a lot of planning. McCalley says there are a lot of issues to consider. McCalley says long-term care is "much more than health care and insurance, it’s about supported transportation, about planning for options to remain in your home, home modifications, and many, many other things." McCalley says research has found a big need for information on the subject. Kris Gross of the Iowa Insurance Division says a letter from the governor will go out to Iowans next week encouraging them to call or mail in a card requesting a tool kit for long-term care planning. Gross says a website is being developed that goes along with this that has information on a variety of local resources that people can use to expand their information base. She says they will also have an exhibit at the Iowa State Fair on the program. Gross says people are facing a lot of things right now and might not be thinking about planning for the future. She says some people may be facing trouble with the economy and losing a job and have to deal with that, but she says hopefully things will turn around and people have to start thinking about what will happen when they hit 65, 75 or 85. Gross says the need for long-term care can happen sooner than 65. McCalley says those who’re are younger may be involved in long-term care for someone else. McCalley says it’s often at the age of 45 or older where you become a caregiver for an aging parent or spouse that has developed a disability. He says the information in the planning packet can link you with area agencies on aging that offer a variety of services for the person that you’re caring for. Iowa is sharing three-million dollars in federal money with Colorado, Kentucky and the District of Columbia to implement and advertise the program. You can call 1-866-PLAN-TLC to get a planning kit.